I am grateful for the variety of quilts brought to me by my customers. It gives me the opportunity to stitch out designs that fit perfectly on their quilts, not so much on mine that are still waiting to be quilted. Bev used a beautiful peacock print as her focal fabric and tone on tone aqua for the background fabric of her Stack and Whack quilt. Today, I am filling in the hexagon shapes. There are about 60 of them so I am using several designs and alternating them throughout. I purchased the designs from Digi-Tech Patterns, Urban Elementz, and made a few of my own using Art and Stitch software. Stack and Whack Block with some peacock feather print showing. If you visit my page often, you may have thought that I have vacated the website but I can assure you that I have been quilting up a stack of customer quilt tops. I apologize in advance for the quality of the photographs. The cold, rainy, and gloomy weather makes for great quilting days; but not so good quilt photography days. My photography skills need improvement, as well. Today's post highlights beautiful quilt tops sent to me for quilting. My customers are truly creative! These are from Rita in big and beautiful Texas. Rita's gorgeous machine embroidered quilts never cease to amaze me. Rita is a tireless champion for Jeff Gordon Children's Foundation/Texas Chapter. She organizes quilt kits, sewing days, and packing days plus many other behind the scenes tasks in order to make and ship beautiful quilts like these to children who are receiving treatment at the three hospitals sponsored by the Jeff Gordon Children's Foundation. And she has an 'oh my gosh' gorgeous sewing room that is fully stocked with the cutest fabrics for these kiddos. Embroidered Cats was quilted with straight lines and I changed the direction to add interest. I quilted the Embroidered Animals with various hand guided free motion designs. More Western! This adorable quilt has embroidered cowboy/cowgirl/sheriff bunnies set with western themed fabrics. I used the same technique of adding pantograph designs around the embroidery so that the embroidery appears to be on top of the background design. A star design was set in each of the cornerstones and sashing setting blocks. I set a rope design individually into each sashing strip and border. April the giraffe and her baby are Internet sensations and this quilt was finished just in time for April's baby. These sweet embroidered blocks remind me of red work embroidery, very lace-like in appearance. They are set together with a colorful giraffe print. I stitched pantograph designs around the embroidery and added fun block designs that represent Molas. There are six different Mola quilt designs created by Patricia Ritter of urbanelementz.com. I chose four of them and alternated them throughout the quilt; floral, lizard, butterfly and bird. Often, digital pattern designers have just the perfect designs for whatever I'm quilting so there is no need for me to draw it out and digitize it myself. 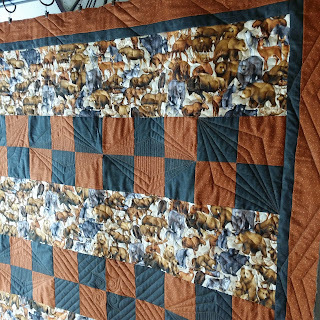 Patricia's Mola designs are a perfect compliment to this quilt. Next is a modern quilt with a cute little bear embroidered and set in the center block of the quilt. Each block has a different hand guided quilting design in it. My photography skills do not show the true creativity of this quilt. 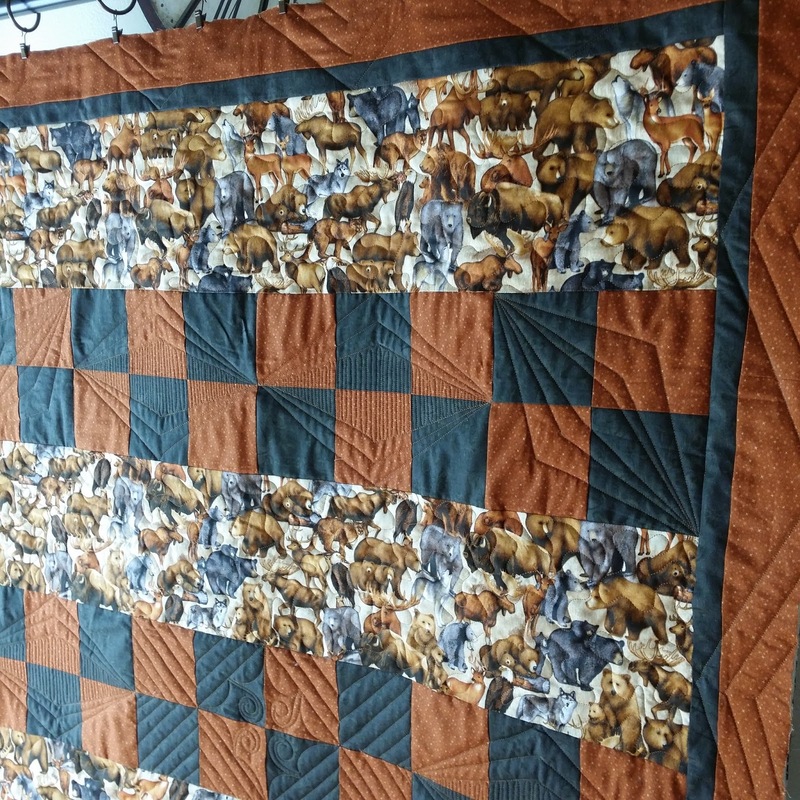 Each block center contains a dense design that depict ancient drawings/etchings and the border is a town scene that that travels around the quilt body, sashing and perfectly mitered corners. The quilting is a mix of hand guided, ruler work and digital designs. Block designs were set into each block individually around the embroidery. I made this Harley Davidson T shirt quilt for a customer in Georgia. 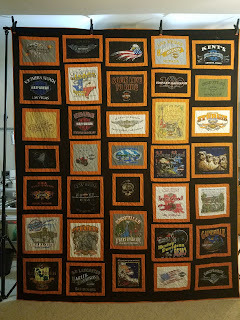 The quilt finished at 103" x 125" using 35 shirts. The logos on the shirts were 13"-20" wide. I do not share or sell your personal information. Please do not copy, retain, or share any information including photographs that appear on my page without written consent. Thank you.